Discussion in 'Dell XPS and Studio XPS' started by Sharadeos, Jan 28, 2012. 8/20/12 Informed about newest BIOS update. 5/09/12 Removed older BIOS files. 3/31/12 A16 GPU BIOS has been uploaded. 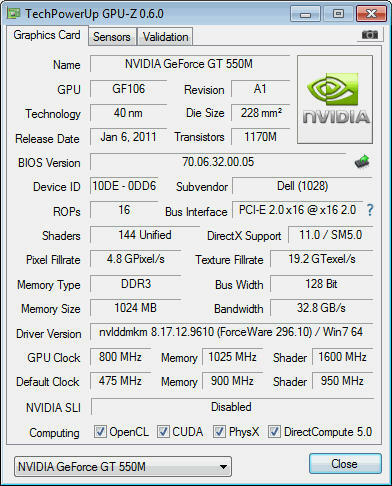 3/25/12 A17 GPU BIOS has been released! Every GPU model is compatible with this release. Hi guys, I just wanted to share that there is a way to change the GPU voltage on the XPS L702x system. You will be able to get a considerable amount of core clock increase with this BIOS. Feel free to ask any question regarding this mod. This is a list of all current and future voltage modifications. Please take note that the voltage change does not affect the 2D mode voltage. Note: This setting is currently only applicable to the GF106 GT 555m. I have tested the GF106 GT 550m version and it does not have this setting. I would just like to thank and mention capitankasar, jkbuha, and seeker_moc (because I previously owned an XPS 1645 system) for their threads on bios modding because the same or similar processes have been used to edit the L702x BIOS. BIOS modding for GPU OC fun and profit!! I would also like to give thanks to the people at MVKTech: Saltius and Mavke for showing examples on other modded video cards. You may also ask them to request a more detailed BIOS such as permanently changing the default clock speeds. Without these individuals these mods would not have been possible. I have tested this BIOS and it is working. I am currently using it on my system. I am able to make other BIOS files of other GPU configurations because they are all bundled within each BIOS revision that DELL officially releases. You will also experience a minor to significant temperature increase depending on the ambient temperature. I suggest performing a reapplication of thermal paste on both the CPU and GPU to negate the possible increase in temperatures. Testing these BIOS files will really help me prove that these files are working. No bricks have been reported so far and I am pretty confident in what I upload. Worst case scenario would be your GPU would not be recognized but you can easily flash back because of the INTEL graphics taking over. After further testing, Worst case scenario is now 3D voltage not being recognized. No failed BIOS flashes have been reported and experienced by me. In order to flash your BIOS, Use the altered version of WinFlash available below for flashing the BIOS. You may also use this utility to flash back to older BIOS versions. In order to use WinFlash and the BIOS file, unpack WinFlash and the BIOS file using any compression utility like WinRar. Then run WinFlash and select the appropriate BIOS for your system. When selecting the BIOS file to flash, be sure to change the file type from "BIOS Image (*.fd;...)" to "All Files (*. *)" so you will be able to see the BIOS file. You may also type the file name directly into the "File name:". The auto complete function should guide you into locating the file. Your system will then restart and flash the BIOS. The computer will then start to beep but don't fret this is normal. You can request a different BIOS version such as A12 or A14. I will make these versions if anyone requests them. Please take note of your GPU BIOS Number. Flashing the incorrect GPU BIOS number will result to ZERO changes to your system because the BIOS will only flash to the appropriate revision. Please read the directions located above this section. Feel free to ask any question regarding the directions if you are still not sure. You may also flash to these stock files if you want to roll back to an older BIOS version. NOTE: Works for all GPU versions! Nice. So when I OC my card, the driver fails when it gets too high. Is this because it doesnt have enough voltage? I am assuming every card is different because others are able to OC higher than me. In a way yes, with this BIOS mod you will be able to achieve higher clock speeds but there is a downside to this you might experience higher temperatures. 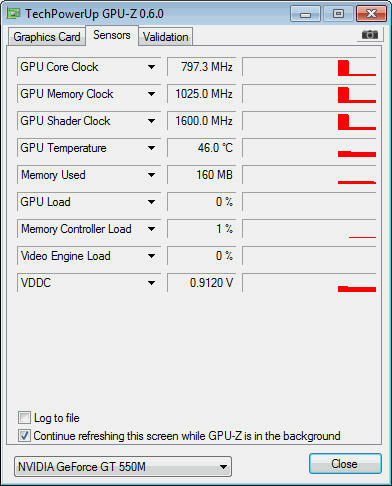 In the GPU-Z screen shot I placed, The clock speeds reported were before overvolting. I will be updating it to see how far I can push this GPU until it artifacts. I am with A12 bios.Do i need to flash to A16 to use this mod.I am with gt555 106 chis. Hey batmemo, I read in another post that you needed A12 in any event something goes wrong. Here you go A12 BIOS. Hi letmeknov, I have already placed the modded bios in the first post. Feel free to try it out and if you can provide feedback. I am pretty confident that the mod will work. is it possible to have an undervolted version for the GF106 GT 555m ? Based on what I have read through the other forums, Our cards can only be adjusted to 3 to 4 set voltages such as 0.8120, 0.8620, 0.9120 and I believe 1.0 for the GF106 and those are only for 3D clocks. I currently have no knowledge on how to modify 2D clocks for this particular GPU. If you still want an undervolted 3D setting with 0.8120v then I can make one for you. Ah ok ! If possible yes, i would like to give it a try. Flashed with your modded bios for gt555m and there is no change in voltage.